Taking feedback from customers is very effective way to ensure that branding and marketing are directed towards right direction. It is important to keep in mind that brand is the main asset of company. Brand drives loyalty with customers which lead to generation of revenue. Customer feedback is one of the primary drivers of long-term growth. Nowadays, organizations jump at every opportunity to talk to the customer. They are spending millions of dollars on setting up feedback channels. Customers always share their spontaneous and frank opinions about the product. There is a “technological trend” of using multiple “technological channels” to take feedback from customers. Why do you need to collect feedback on regular basis? When the importance of taking customer feedback is known, let us discuss multiple ways of taking customer feedback with examples. This ensures that your company is not just attending them, but also enthusiastically providing them many avenues to speak with you. 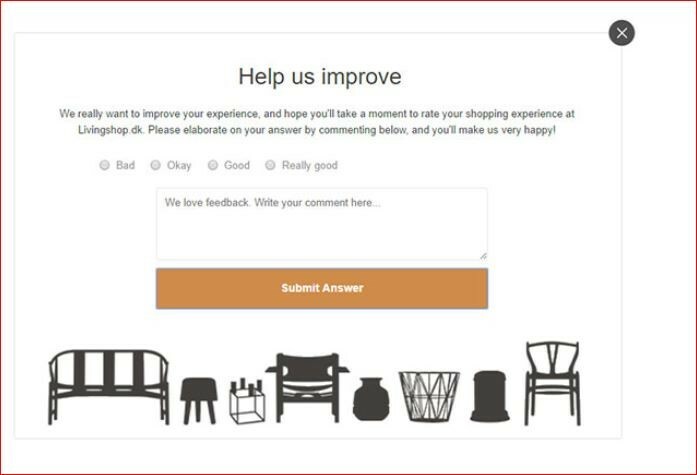 The best way to deal with customer feedback is through the website. It is the place where most likely customers will interact with you. The simplest way is to pop up feedback survey form to grab attention of website visitors. 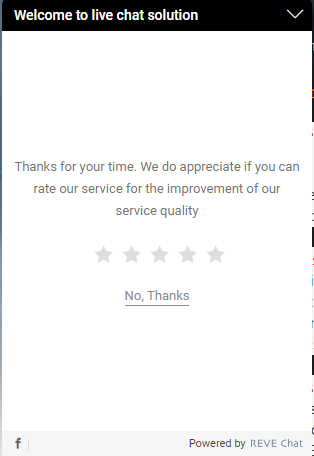 While designing the feedback form it is important to keep it short to encourage customers to fill it. Instead of yes/no type of questions you can go for open ended questions to get in-depth responses. Email is one of the most valued ways to gather candid feedback. Email is not “public” like social media platforms. This method is “personal” to start discussions with customers. When customer has signed up to access information via email you can send auto res ponder email which asks single question about the product. But don’t forget to reply to such emails. Through email either you can ask the questions directly (don’t go overboard) or you can invite them for a chat. Set a soft deadline by intimating when you’d like to receive a response by and then follow up if you haven’t received an answer within a week. 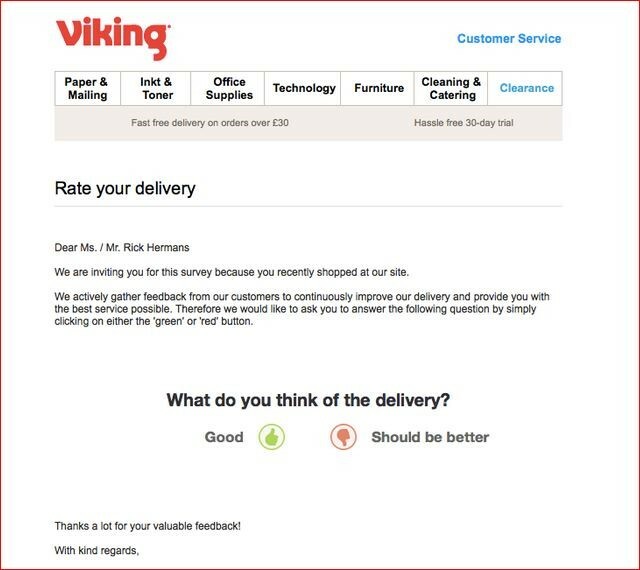 Example – Viking does a great job at it by asking users to rate their delivery right after they have delivered a product. The most indispensable feature of click to chat supported by live chat allows you to be always there for your customers to understand their needs. You can check who is on your website in real time and start a chat with your customers. Website visitors just click a button to communicate in real time directly with online service agents via live chat. The most essential feature of click to chat supported by live chat allows you to be always there for your customers. The main advantage of live chat is the real-time connection with a customer, which is powerful when attempting to build a relationship. When you are trying to help customers via live chat, you are obtaining feedback in real time. Remember to address all your customer’s concerns and to do so with helpful information. The faster you solve their problems, the more likely you are to turn a poor experience into a good once. Example – REVE Chat offering a section from where you can collect the feedback of customer after completing the communication with agent. Of course, we cannot forget about social media platforms like Facebook, Twitter and many more. Social media is a significant channel for collecting customer feedback. Provide customer support to customers in quicker way just by dialing a phone call. Ley’s carried out Facebook campaign as “Do Us a Flavor” which requested customers to name a new flavor. This campaign was successful on many stages. Helped to measure product loyalty. Improved customer trials that enhanced sales. Win-Win situation for contestants to use their own social media circles to chances of winning and created free advertising of brand. 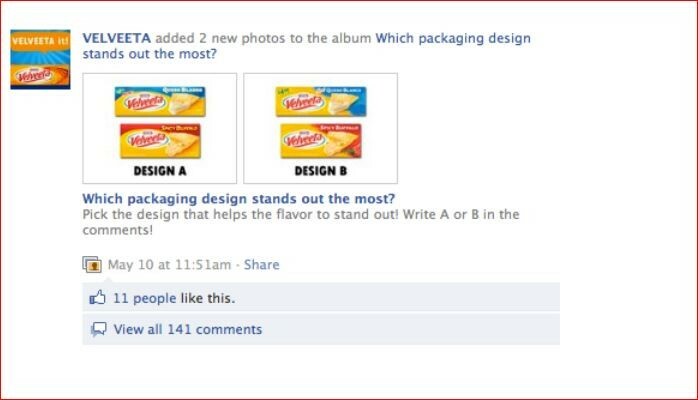 Example – Digital agency 360i advised its client Velveeta to poll its Facebook community for consumer insight into which new flavor packaging concept would highlight the flavors in a more prominent way. Velveeta asked fans to “pick the design that helps the flavor to stand out,” and provided photos of each (marked ‘A’ and ‘B’). The community was very responsive to the poll, demonstrating a very high feedback rate compared to other posts. The poll results later helped Velveeta solidify its decision on the new flavor packaging. Reaching out to customers via calls and messages give a “personal touch” for customer service. Customer can give candid feedback when provided with personal touch. By making it personal, customer is likely to remember the feedback. It is also fruitful to gather references directly from customers to increase sales. Calls can be done to the numbers provided in the database provided by the customer. In-app feedback is a fantastic way to collect information from people as they are using your product. App is the easiest platform for customer feedback. With this mechanism customers are provided with input thus the formal surveys are not required. As this mechanism is built in in your app, customers can access it anytime. Example – Survey Monkey provide online survey solution that helps you get feedback quickly. They have now released their new SDK (software development kit) for mobile integration. Create Online Community And Get Reviewed! Communities have volunteers that lead to the sharing of best practices on using the products. Customers, who prefer quick solutions, choose online community as a chat feature. This enables direct customer support to users. You can use any tool for customer feedback. But it’s important to remember that, it is not only the bonding which nurtures the relationship with customer but the strong bonding of loyalty that matters! Customer feedback can serve as a launching pad for your business’ growth. Use above mention methods to expand your business in a way that leads to happy customers, retention, and higher sales.